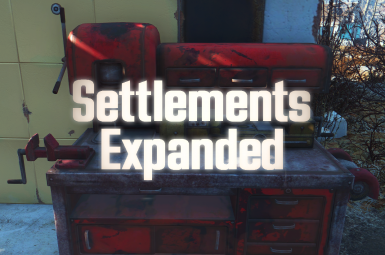 Settlements Expanded expands upon the settlements framework in Fallout 4 by expanding the settlement budget (max number of placeable objects). In the future this mod will further expand settlements in various ways. Thanks to GrimTech for the Settlement Budget value! Resolved an issue in the startbuildmode batch text file. Revised the stopbuildmode batch text file. Revised the expandsettlement batch text file for clarity. Now supporting NMM Installation! If you like this mod be sure to endorse it! I forgot I was playing with the Darker Nights mod installed during recording, so I did my best to brighten up the video during editing! READ ALL IMPORTANT NOTES IN YELLOW BEFORE INSTALLING THIS MOD! FAILURE TO DO SO WILL LIKELY RESULT IN A FAILED INSTALLATION, AND I WILL NOT OFFER SUPPORT TO PEOPLE WHO CANNOT READ! The goal of Settlements Expanded is to unlock and add functionality to, many of the objects within the Fallout 4 world that are clearly missing from the construction menu when designing your settlements. If possible, I would also like to add more functionality and options to those objects that are already available within the construction menu. I would also love to work with others to add new, lore friendly objects to the settlements construction menu as well. 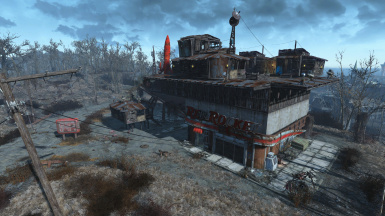 This mod will also expand the maximum number of placeable objects within settlements. Lastly, I would also like to increase the height for building settlements (hooray skyscrapers! ), add new settlement locations, and more. Important Note 1: Until scripts are unlocked by the release of the Fallout 4 G.E.C.K. (Garden of Eden Creation Kit) or some other method is discovered to do so, this mod is currently limited to what it can do via batch files. As such many intended features are still planned as a result. 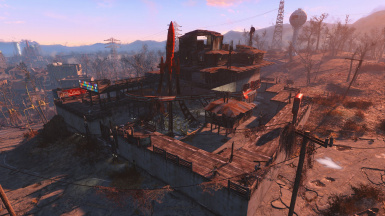 Important Note 2: Bethesda placed a maximum placeable object limit to settlements for a reason. The more you extend it and the more objects you add, the more things will slow down, and it may even increase your chances of crashing, so be sure to save often and use at your own peril! Add the archive file to Nexus Mod Manager and install. Choose your desired options and follow the in-game instructions for use. Extract the contents of the [0-TEXT Files] folder into your DATA folder. By default this is C:\Program Files (x86)\Steam\steamapps\common\Fallout 4\Data. Start up your game and head to the settlement you wish to expand. Open the console by pressing the tilde (~) key. With the console open left click the workshop. You should see the ID of the workshop pop up. Type the following without the quotes into the console: "bat expandsettlement"
*OPTIONAL*Type the following without the quotes into the console to add the perks to build everything: "bat startbuildmode"
*OPTIONAL*Type the following without the quotes into the console to get 1,000 of every building material type: "bat getbuildmats"
*OPTIONAL*When you are finished building, type the following into the console without the quotes: "bat stopbuildmode"
Close the console and use the workshop, you should now see the Size bar in the upper right is empty. Repeat for every settlement you wish to expand. Important Note: The optional items are highly recommended for non-serious playthroughs or at the very beginning of a playthrough before you have placed any perk points. These items will add perks and items that benefit your character outside of settlement building, and can ruin your playthrough if not turned off! Find the default location of your Fallout 4 Data folder. (By default this is C:\Program Files (x86)\Steam\steamapps\common\Fallout 4\Data. Q: I am trying to follow your usage guide, but the commands are not working! A: They are not working because you are either including the quotes (") or because you did not unpack the files to the correct location.